Diced tomatoes and green chilies make this mac and cheese as colorful as it is zesty. Cook macaroni as directed on package, omitting salt. Drain. Microwave VELVEETA and tomatoes in large microwaveable bowl on HIGH 5 min. or until VELVEETA is completely melted and mixture is well blended, stirring after 3 min. Stir in milk. 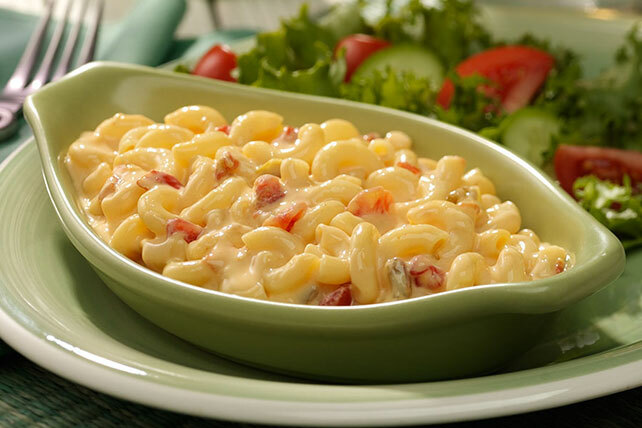 Add macaroni to VELVEETA sauce; stir to evenly coat. It’s easy to adjust this recipe for kids or for anyone who likes a little less spice. Prepare as directed using RO*TEL Mild Diced Tomatoes and Green Chilies, featuring the ripest, plumpest tomatoes but with a little less kick.